Good idea, but the readability could be better. Can one change the color of the link types? Thank you for posting. The color of the list background is usually determined by the Theme. 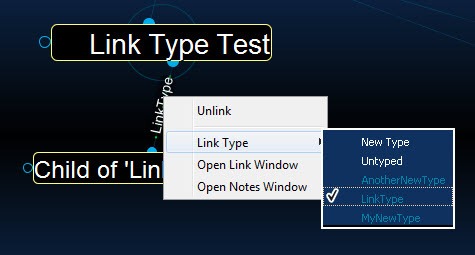 rengel, I think you can change the text color you see in the new link types menu by changing (options > preferences > color > links, normal). To change the entire background of the link type menu, here is what I did since I have a set image as my background. I changed (options > preferences > color > background, center and background, top and bottom) to my desired blend of colors. Remember, if you have one of the default themes set, tweaking the two settings will alter your background unless you have an image as your background. This was the default setting ('fresh from the factory'). I didn't change any link colors. The text should be more readable than the default shows. What is it good for to show the text using the link color? The color ist NOT used, when the link text is shown in the plex. 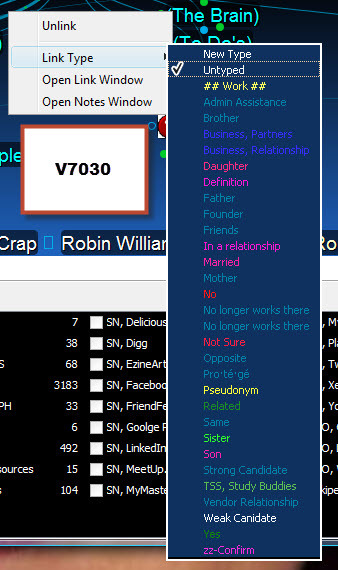 The Link Type selection box has changed between V7029 & V7030. The Blue background is hard to read. How is the background color being selected? I like being able to see what my Link Type color is going to be thou. The background color for Thought Type is Black. Thank you for the additional input. I will bring this to the attention of our developers. 1. The colors used in the menu are in fact the colors that are displayed of the links, not the link text - that is the confusion. 3. The background color of the link menu is the average background color. I agree in some cases the link text does not stand out enough. This is because it simulates the color of the link on the background, which is intentionally not high contrast. We'll have to think about another way to do this.